Last night I had yet another Mezzo TV experience. First, allow me to explain what this means in general. Living in an area with rather limited active cultural life and narrow-band choice of music in public media the unbelievable quality and breadth of Mezzo TV seen in satellite channels connects me to the wider world. Uniquely, I would say, there is nothing like it in radio or TV here or among the hundreds of satellite channels visible. After watching and listening some performance I usually feel a little less ignorant, a little bit less outsider as the magnificent programs expand my knowledge of composers, artists and musical companies. So I am not ashamed to confess (or maybe a little...) that through Mezzo TV I have learned about Jordi Savall's extraordinary work on Albigensian Crusade, about the exceptional charm of Renée Fleming, seen Händel's Rinaldo at the Caen Theatre with the Collegium 1704, learned to appreciate the Green by Johann Sebastian Bach... the list is long. All this would be unreachable for me without this precious TV channel. Last night it happened in the usual way - casual browsing of channels for something worth to watch, stopping for a moment at Mezzo (for I am not always in tune even for the best of musical performances), quick look at the Jazz offering and ... My thumb simply stopped not so much on what I saw but what I heard! This is usually dangerous and was again so - I was hooked even knowing that tomorrow is regular work day. For what I heard from the 2011 festival at Fes was not really Jazz. It was something I have never heard before. First of all I was attracted by how comfortable and relaxed the singer was in front of full house audience. Then I noticed the easy at which each musician handled their instrument - easy that only comes with complete mastery of it. Then the sound started to sink in; Super Etoile de Dakar players formed a single organic body playing complex rhythms and melodies in total harmony over which Youssou N'Dour developed his singing as an integral part of the whole. Particularly impressive was the joining in of an Arabic singer with beautiful voice and his background group of four humming Allah, Allah. Youssou joined in as if he was one of them. Arabic I understood more or less but what he was singing I did not have any idea of. 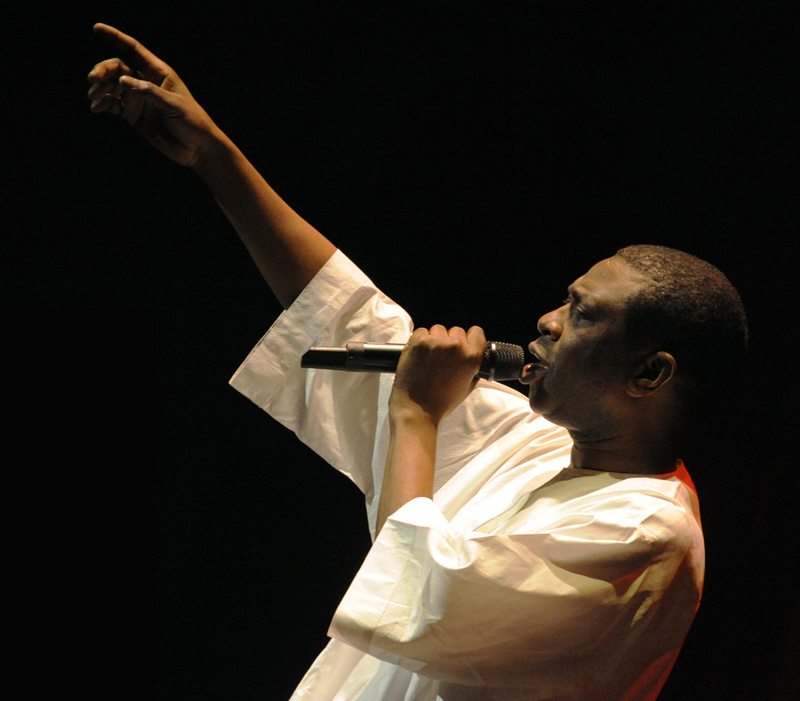 No wonder Youssou N'Dour recently n 2013 won a share of Sweden's $150,000 Polar music prize for promoting understanding between faiths as well as for his music (Reuters 2013). By time my ear started to recognize different instruments in the pleasing and interesting flow of kind of music I have never heard before (ignoramus as I am). I was astonished by the quality and beauty from the electric guitar - and learned soon that yes, it is indeed a Fender Stratocaster played by Senegalese Jim Mbay - and that Jim is internationally known as one of the most celebrated African guitarists if not the most. Similarly, the famous bassist Habib Faye did not try to impress anyone - he just played what came to him, and it impressed everyone! But that was not all. There was something in the sound of the band that I did not quite catch first - an unusual and very catchy beat. The western drum set it was not nor was it the skilled bongo player, these are familiar sounds. Could it be that ridiculous little thing Assane Thiam was holding near his head with such obvious joy? And indeed, there was a microphone near the tiny drum and the exceptional beat came from it Assane beating it with right hand fingers and holding a kind of spoon in his left hand. 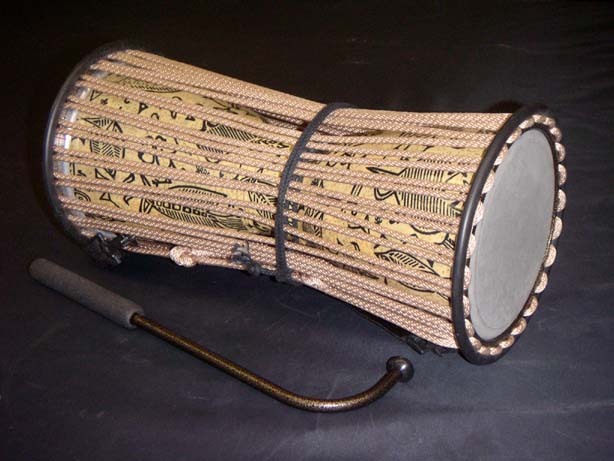 I learned that this is a "talking drum" called tama and what a difference it made. Unforgettable! Last night I also learned while listening to the enthralling music that Youssou N'Dour is a world famous artist and also an important politician, currently the Minister of Tourism and Culture of Senegal. Mezzo TV has thus - again - made me a little less ignorant about world class music and art. No, Jazz it was not. The music Youssou N'Dour et le Super Etoile de Dakar played deserves its own category - the proper name for it is mbalax.